This is the saddest sundial in the world. It cries more than it works. I seriously believe that it’s more like an architect joke. It’s set in an angle where the sun will only let us know the time during the morning. 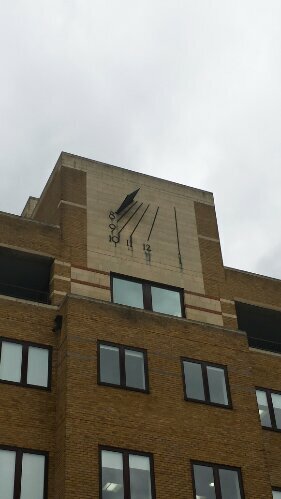 And if missing the time of half day wasn’t waste enough, it was added to this building in Angel, London, England. A sundial that works only one morning a week… it has to be a joke, I resist myself to think that any architect can be that naive, or any promoter so short sighted! He aquí el reloj de sol más triste del mundo. Llora más de lo que funciona..
A mí me parece q en realidad es una broma de arquitecto o así. Lo ubicaron en un ángulo que sólo nos permite ver la hora por la mañana. Y si no fuera bastante desperdicio no saber la hora de la mitad del día, lo añadieron a este edificio de Angel, Londres, Inglaterra. Un reloj de sol que sólo funciona una mañana a la semana… tiene que ser una broma, me niego a pensar que algún arquitecto haya podido ser tan inocente o un promotor tan corto (de miras)!